She looked absolutely beautiful, anyway. Sarah looked gorgeous, too. I will post pictures later (with their permission). It’s still beautiful, though. Good job. Did you get the base at Wright’s? YES, I went to Wrights (blessings on your head, Mazel tov). Actually, I got everything there but the ribbon and the green tape and wire I already had. I used spray roses (they ARE small…), got the guy to sell my one sprig of myrtle (yeah! ), one lemon leaf branch (double yeah! ), but I asserted that the big bunch of hypericum looked “tired” and he said they were not “traumatized.” Phhhht. But he sold me a bunch of these…berry-like spriggy things from Mexico at a discount. That place really does ROCK – thanks for the heads up. I WAS trying to be restrained, I promise. I think you’d be really proud of the boutonniere. It’s just that while making the corsage I’d made two smaller bundles (as the ends) and then I had to somehow get the middle to be filled in and there HAD to be an odd number of roses…. You’ll be proud to know that I omitted the beading. (Yes, that’s sad – I was going to bead little accents on wires…). 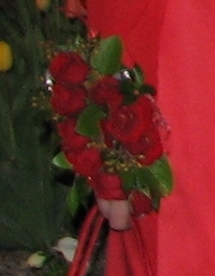 And secretly, because there were so many spray roses left (HUGE bunch for not very much money) I made my Dad a boutonniere and my Mother a corsage (only FIVE roses…) AND made an Ellen Degeneres Show type arrangement of the remaining roses that we gave to my uncle because he broke his collar bone. Buyo, that is SO unfair! At the most it is the size of a very wee kitten, all curled up in a cute, sleeping ball.